When I joined parkfit over 2.5 years ago, to say I was overweight and unfit was an understatement! I could hardly run, do sit ups or press ups but the group were so warm and welcoming and the instructors had nothing but encouragement for me. it was an easy choice for me to return week after week. No session is the same so you could never get bored! This is a Awesome all body workout for anyone who wants to get into that knockout dress at Xmas... I've only done 1 session but my body has never felt so sore and battered which means that this works ! I've seen the results on my friends & we all have a gr8 time. Would definitely recommend Park Fit to all. 5 SIMPLE STEPS TO get to that early morning Parkfit class!! Are you a serial snoozer when the alarm goes off? Let’s see if we can convince you of the benefits of waking up early and starting the day right - because what’s better than getting your fitness session done whilst most people are still sleeping, setting you up for the day! Waking up early can be a little hard at first, however once you put a few steps into place, you'll become a morning person in no time! So here goes, follow these simple steps and you soon will be gloating to your friends that you’ve already got your fitness session in the bag before the kids have the school books in theirs! Step 1 - Goal setting. Small goals are more achievable and achieving them makes you feel good about yourself. Once you’ve accomplished your goal, you can move onto the next one - this makes you more likely to stick with it! Write them down - and read them before you go to sleep. There’s a good chance that the last thing you think about before you go to bed will be the first thing you think of when you wake up - result! Get your fitness clothes out and lay them at the end of your bed. Remind yourself why you started Parkfit and what you want to achieve. Then as soon as that alarm goes off, you will know why it’s important to get out of bed and get the day started. Even have your goals next to your bed and ready to re-read as soon as you wake up. By having that constant reminder of where you want to go, will help you get motivated for the day. When you wake up you are instantly dehydrated which is half the reason you can feel so groggy and want to fall asleep. Most people then make the mistake of reaching for a coffee straight away, which only dehydrates you more. As soon as you wake up, the first thing you need to do is drink at least two big glasses of room temperature water, with a big squeeze of lemon in it. Also try sprinkle of some Himalayan salt in the water, which will help restore all your electrolytes. If you have to reach for the caffeine, make sure it’s after you’ve rehydrated yourself. Step 4 – Set a solid sleeping routine - and stick to it! If you are guilty of going to bed super late watching television, surfing the internet, indulging in hours of social media or burning the midnight oil working - then you need to stop. To become a morning person you need make sure you have a regular sleeping routine, so your body clock knows when it’s time to go to sleep - and when it’s time to get up. We recommend giving yourself at least an hour of no technology before you go to sleep, which gives you the best chance to unwind from a busy day and promotes good sleep. As soon as you get dressed you are telling your body, it’s time to get up and start the day. Make sure you lay out your clothes the night before, so it’s all ready to go as soon as you wake up. Ensure your breakfast is all prepared the night before. The more obstacles you can remove from yourself in the morning the easier it will be to get the day started. Remember living a healthy life is all about the habits you create for yourself and stick to on a daily basis - so set a routine that’s easy to stick to and doesn’t disrupt you or the rest of the family. This way you have the best chance of success. So to become a morning person, you just need to make a few simple shifts in your daily habits. Once you;ve taken the plunge and done it once, the feeling you get will spur you on to do it again and again. So start getting up early, make sure you set yourself a healthy morning routine that will get you motivated and ready to take on the day. You will become a regular face at the Earlybird classes in no time!! Exercising outdoors has shown to burn far more calories than exercising indoors! Why? Because people who exercise indoors face no wind resistance, changes in terrain or adverse weather conditions to make their bodies battle harder during their workout. So even in winter when the weather is at it's worse, just by being outside you are already working harder than those inside! In fact, the worse the weather, the more calories you are burning! Endorphins – we’ve all heard of these (the thing which makes us feel good!) and we know we get them from exercise but did you know people who train outside experience higher levels of post exercise endorphins? And not only will you feel better about yourself after an outdoor workout than you would an indoor one, did you know they also act as natural pain-relievers! Win win! Fresh Air – sounds obvious and we can all recall our parents encouraging us outside for that all important “fresh air” but it’s benefits are far greater than you think. Not only is it invigorating and refreshing the high oxygen levels generated by this gorgeous stuff also increase efficiency of almost all the reactions in your body – from weight loss, improved sleep, reduced anxiety and lowering your resting heart rate, yep they are all accelerated by fresh air. How refreshing! Serotonin – helps you feel calm, alert and able. Exposure to the outdoor world boosts serotonin - so you’ll feel good about yourself and calm - ready to face the world! Vitamin D – this comes from natural sunlight which helps promote the absorption of calcium providing strength to the bones, reducing inflammation and boosting the immune system. Now you can’t get that in the gym! Variety- this is so important if you are to sustain any exercise routine, and exercising outdoors gives you far more space and flexibility to perform exercise routines and work muscles functionally –things that just can’t be achieved in a gym. So next time you think about missing a session because it’s a bit cold or wet, get your outdoor kit on and get out there knowing that you will be burning far more calories than someone sweating it out in a gym! Parkfit – we know what we’re talking about! Obstacle course racing (OCR) is one of the most popular recreational sports on the planet right now! As more and more people get involved with this sport, the most common question becomes, “what is the best way to train for an obstacle course race?” Proper training for an OCR will not only enhance your performance on race day but it’ll have you in the best shape of your life! The actual race will challenge you both mentally and physically to conquer obstacles that will test you in running, ascending and descending, grip and pull strength, endurance and carrying heavy objects. If you put these skills to the test in your training then you’re going to see great things. 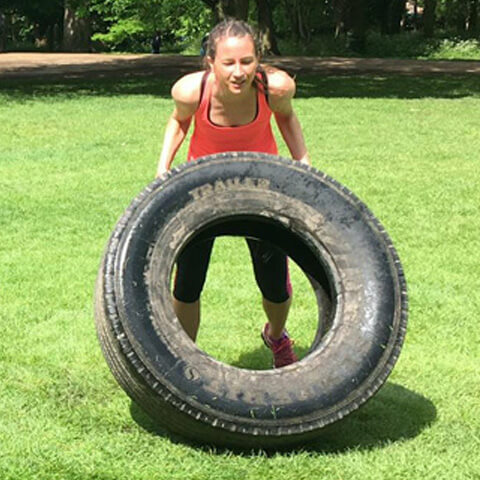 So how lucky are you if you live in Hertfordshire - the biggest and probably the best Obstacle Training Ground is opening in July 2018 in Bassingbourn and it’s packed full of challenging and innovative obstacles. It’s also designed for both the expert and novice alike and with hard and easy(er!) options for most of the obstacles there’s something for everyone. It’s great for families too! Head over to their website for more information. Parkfit 2019. All rights reserved.